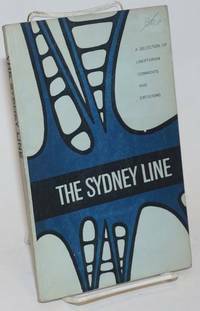 Sydney, Austrialia: L.R. Hiatt, 1963. Paperback. 125p., wraps soiled and worn, minor foxing, else good condition. 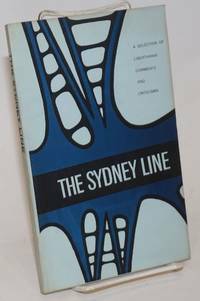 Sydney, Austrialia: L.R. Hiatt, 1963. Paperback. 125p., wraps slightly worn else very good condition. 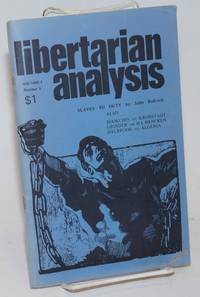 New York: Libertarian Analysis, 1971. 60p., staplebound wraps, 5.5x8.5 inches, some pen underlining, a reading copy. Laid in is a brochure promoting the journal. Amherst, NY: Prometheus Books, 2000. Hardcover. 400p., green boards and dj, illus., as New. New York: Cook & Taylor Publishers, 2014. Paperback. xxvi, 486p., has a b&w photographic section (personal snapshots), thick softbound in 9x6 inch glossy white wraps. Slightly edgeworn, otherwise entirely sound, clean and unmarked. Columbia, MO: C.A.L. Press, 2012. Paperback. 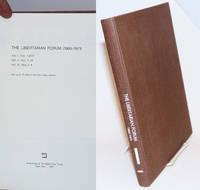 204p., stiff pictorial wraps, 8x10 inches, illus., small dog-ears to a few pages, else very good. First issue of new left-libertarian / anarchist twice-yearly journal. 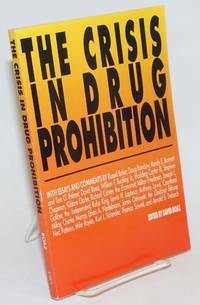 Heady material by Jason McQuinn, Ron Sakolsky, Wolfi Landstreicher, Bob Black, Voltairine de Cleyre and others. Mountain View, CA: Libertarian Republican Organizing Committee, 1990. 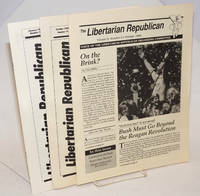 Three issues of the staplebound newsletter, 8.5x11 inches. Numbers present are vol. II no. 2 and whole numbers 19 and 21. Raimondo, a gay Libertarian activist, developed into a Pat Buchanan fan. Las Vegas, NV: Vegas Alliance of the Libertarian Left, 2011. Pamphlet. 20p., softbound, a pamphlet in 8.5x5.5 inch decorated wraps; nice clean copy. A publisher's note says text at hand "was originally published as the Third Study of Idee generale de la revolution du XIXe siecle in 1851. This edition is based on John Beverly Robinson's 1923 English translation." 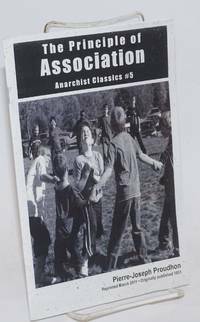 Anarchist classics #5. Arlington, VA: Young Americans for Liberty, 2010. Magazine. 42p., 8x10.5 inches, staple-bound magazine, illus.very good. 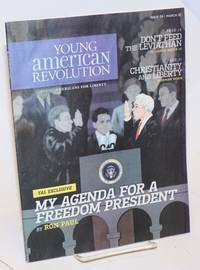 The Young Americans for Liberty is a libertarian/conservative youth organization that grew out of the ranks of student supporters of Ron Paul in his campaigns for U.S. president.Their present website would seem to be somnolent. The magazine's editor, Daniel McCarthy, is now editor of Modern Age, the quarterly conservative journal originally founded by Russell Kirk. Mountain View, CA; Palo Alto: Libertarian Republican Organizing Committee, 1992. Eight issues of the staplebound newsletter, 8.5x11 inches. Numbers present are vol. II nos. 1, 2, and 6, and whole numbers 19, 21, 24, 27, and 33. Raimondo, a gay Libertarian activist, developed into a Pat Buchanan fan, a trajectory which is highlighted in the pages of these issues. Some of the original contributors dropped out as the publication moved toward an "America First" position. Auburn, AL: Ludwig Von Mises Institute, 1988. Paperback. 87p., trade paperback, sunned spine, light soiling to cover, lower right bumped corner, perfect-bound binding still intact though aging, else good. 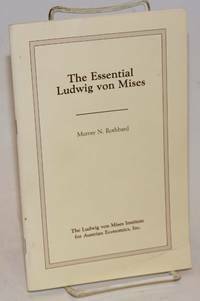 Published by Lew Rockwell's Mises Institute in Alabama. 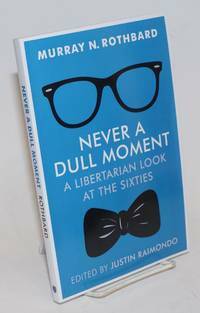 Rockwell and Rothbard were part of the effort to align libertarians and paleo-cons. Los Angeles: Family Council on Drug Awareness, 1990. 6-panel brochure folded to 3.75x8.5 inches, photocopied on blue paper stock, very good condition. 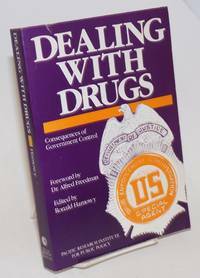 The FCDA was "founded in 1989 to develop and present reliable, factual information about drugs and drug policy." Sample question: "Q. Is Marijuana Addictive? A. No, it is not. ... On a relative scale, marijuana is less habit forming than either sugar or chocolate but more so than anchovies." Part of a broader effort to re-legalize cannibis. San Francisco: Pacific Research Institute for Public Policy, 1987. Paperback. xi + 385p., trade paperback, tiny scrape near top edge of front cover, small name sticker on inside cover, else very good. Washington DC: Cato Institute, 1990. Paperback. viii + 148p., trade paperback with slightly worn wraps, else very good. Pensacola, FL: Vance Publications, 2005. Paperback. x +118p., trade paperback, very good. 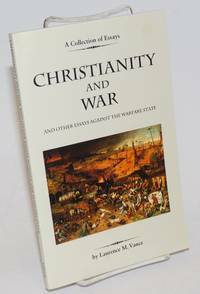 Christian and Libertarian arguments against war and the Warfare State. 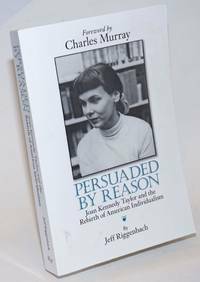 Book's dedication is to Lew Rockwell of the Von Mises Institute. New York: Arno Press & The New York Times, 1972. Hardcover. hardbound reprint edition of Vol. 1, Nos. I-XVII; Vol. 2, Nos. 1-24; Vol. 3, Nos. 1-4. 8.75x11.25 inches, very good unblemished copy save for a hint of must. 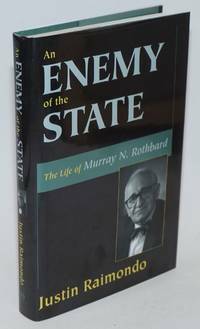 Chronicles the period when Rothbard and Hess were attempting a libertarian bridge between the New Left and the Right of sorts. Includes dissections of SDS, Weatherman, the"Death of the Left", "Nixonite Socialism", the "hooliganesses" of Women's Lib, etc. Rothbard, Hess, and Leonard Liggio in rare form. Burlingame, CA: America First Books, 1996. Paperback. xiii + 141p., 4.75x7 inches, pictorial wraps, very good condition. 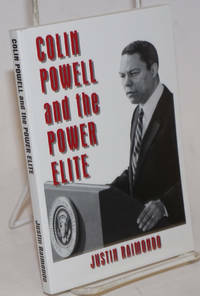 Written and published for the America First Political Action Committee, associated with Pat Buchanan's presidential campaign, and apparently published as a preventive strike against Colin Powell prior to the 1996 Republican National Convention. Herein find Cecil Rhodes, J.P. Morgan, the Council on Foreign Relations, and Arianna Huffington. Quite a rant! Auburn, AL: Ludwig Von Mises Institute, 2016. Paperback. 167p., trade paperback, as New. 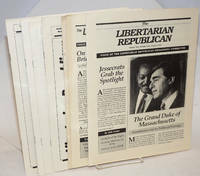 Reprints 58 columns that appeared in libertarian newspapers in 1967-68 commenting on issues of the day. 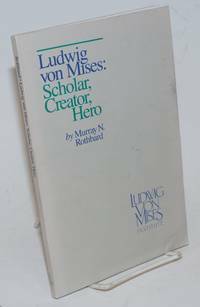 Washington DC: Ludwig von Mises Institute for Austrian Economics, 1983. Pamphlet. 47p., 5.5x8.5 inches, stapled wraps with light crease at lower right corner, else very good revised edition. Palo Alto: Unz Review Press, 2016. Hardcover. xiv + 686p., cloth boards, pictorial dj, as New. Ron Unz is the publisher of the website magazine the Unz Review: an Alternate Media Selection. 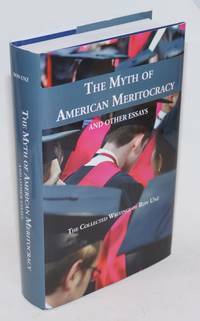 Many of the essays collected here originally appeared in American Conservative and the Unz Review.